Across the United States, police and fire departments are using drones to do everything from assist in hostage situations to increase firefighter safety, but these benefits are just the beginning of how the technology will be utilized by public safety officials. By using drones as first responders, officers can easily gather and utilize real-time information that they know is accurate. It allows them to make better decisions in a faster manner. 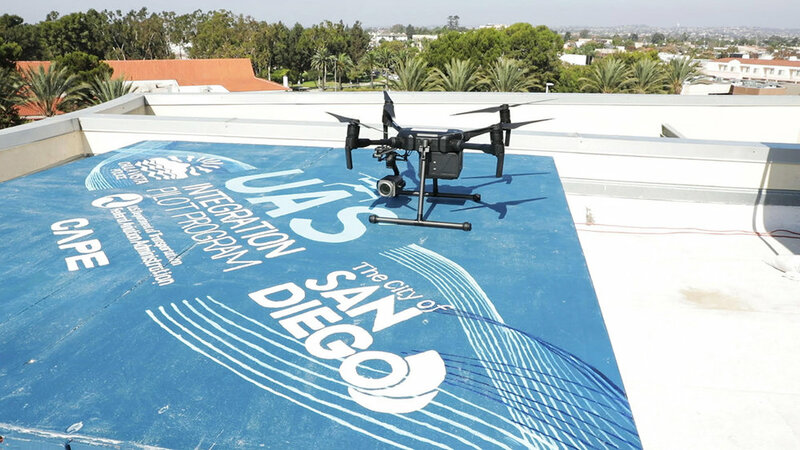 As one of the agencies involved with San Diego’s participation in the FAA’s Integration Pilot Program (IPP), the Chula Vista Police Department (CVPD) is helping to pioneer what it means for police departments to think of and use drones as first responders. 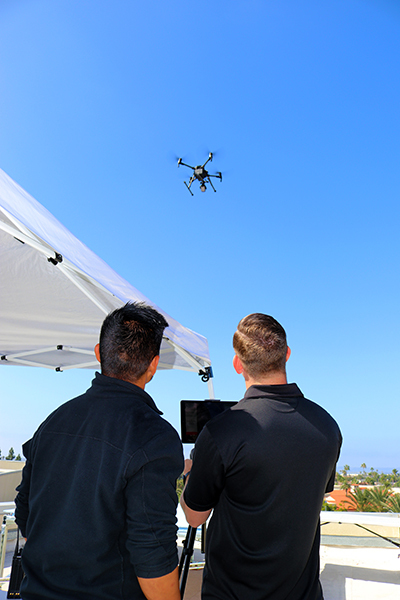 CVPD is working with Cape to integrate Cape-enabled drones into daily emergency response operations to give CVPD officers and drone operators the ability to share valuable information. These new tools and processes are proving to make everything safer for both officers and their entire community. 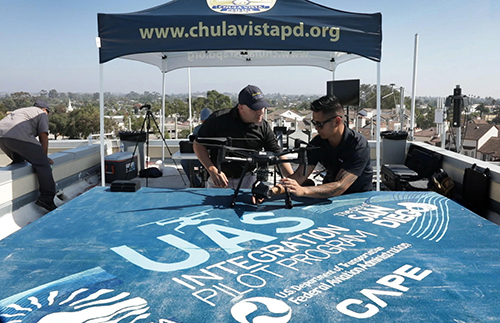 The Chula Vista Police Department and Cape are at the forefront of the endeavor to define what it means for public safety departments to think of and utilize drones as first responders. That definition will revolutionize how departments of all sizes and officials working in various capacities will approach emergency and non-emergency situations. What Kind of a Difference Can Real-time Info Make? Officers in police departments across the country respond to countless calls every day, and the information they receive about a given situation can vary from being incredibly specific to non-existent. Calls that come into dispatch are often from people who are traumatized or simply unable to provide accurate information, which means officers are often going into situations where they have to access what’s happening and make a decision about how to handle it in quick succession, if not simultaneously. By using drones as first responders to these situations, officers can gather real-time information to make tactical decisions like coming into a situation via the northwest corner instead of the northeast corner, or whether the report of an individual having a weapon in their hands is true or not. It’s a difference that goes beyond talk about efficiencies and even experience, which is something Chula Vista Police Chief Roxana Kennedy has seen firsthand. Officers that know they have the correct information about a given situation are going to treat it differently than one they’re actively assessing. That difference is a major point of consideration for every type of call that a police department fields, and every call that an officer responds to. It’s a difference that some larger departments have enabled thanks to manned aircraft support, but that’s not often a realistic option for the CVPD. Their department does not have a manned aircraft program, and while they can receive aid from nearby departments, it’s really not something they can rely on given those departments’ own needs and priorities. That’s part of the reason that being able to use drones as first responders has made such a difference for the CVPD. Information from a drone can literally be in someone’s hand since everyone from patrol officers to supervisors can see and access the information a drone is capturing on their phones. How such capabilities are being incorporated into established police department processes along with the public’s acceptance of them doing so can be a challenge, but as the CVPD learned, success with both all comes back to how they’re being approached. A few years ago, a lot of agencies in the public safety space rushed to deploy drones in their operations without really thinking ahead as to the concerns that their communities might have. That’s part of the reason the CVPD took a more deliberate approach in terms of their community outreach, and why information about how they’re using drones to support police operations is readily available. This approach also saw them thinking through what it would mean to develop the right SOPs and policies, which meant considering the logistics of adoption within the department. Lieutenant Chris Kelley is a patrol watch commander but is also running the drone program at the CVPD. He has a team of about 17 officers that he supervises on a daily basis and was in charge of training these officers to use the technology to essentially be another set of eyes. He’s worked with officers to get their Part 107 certificates without any additional training funds. He initially wasn’t sure how they’d respond to this additional assignment but found that they invited both the training and deployment of the technology. Much of that reaction is the result of the vision Chief Kennedy laid out when the department first started looking at adoption. From the very beginning, she made sure everyone realized the technology is not replacing officers, but enhancing their safety along with the publics. That enhancement of safety is about both awareness and communication though. Every single time a CVPD drone goes up, senior members of the department can get an alert on their phone and can see what’s happening. Various members of the department can communicate with others who are or will be on-scene and help with the decision making process. This ability has changed the way communication within the department works as information is coming in, along with decisions about what action to take. A watch commander is generally in the station or in the field and can’t get to every call for service, but this technology allows those commanders to have a virtual presence in them. They can see what’s going on and deploy the right resources in a way that would otherwise be impossible. Their success in doing so has meant that other departments are approaching the CVPD about their program because they see the benefit, but what should that process actually look like? What Does It Mean to Enable the Successful Adoption of Drone Technology? The importance of the deliberate approach that the CVPD took with engaging with their community can’t be overstated. The department valued their relationship with the community, which is why they went to them at the very beginning of their adoption process and explained what they envisioned with their program. They invited community input with regard to their policies and SOPs and even met with the local ACLU. All of that garnered a lot of local support and continues to be an active conversation, which is why they’ve had very little pushback from the community. Working with the right partners has also helped the CVPD enable success with the technology. The IPP allowed them to work with the FAA, while Cape has provided them with the means to proactively approach emergency situations. Working with the right partners has also opened up unexpected benefits that have created entirely new value propositions. The different ways drones are being utilized once people have their hands on them is staggering. The autonomous functionalities of the technology will create further value and enable it to scale in the public safety space. Those functionalities along with BVLOS operations represent long-term goals of the CVPD drone program, but these goals shouldn’t be the focus for any department looking at adoption, and they aren’t even what the CVPD is actively focused on. The enthusiasm for drones within the agency has allowed them to look at building relationships with local community colleges that are also starting to explore drone pilot programs. That’s where Chief Kennedy and her team focused their energy and outreach. They’ve also engaged and partnered with the Chula Vista Fire Department to enable drones as public safety assets, instead of just law enforcement assets. Other stakeholders in the city have recognized this potential as well, as the public works department realized they could use drones to check the riverbeds for clearances during the rainy season to ensure that all the drains are clear. CVPD has recognized that there are multiple ways they can partner with their community and that they still have a long way to go with the technology. However, they also realize that doing so will become more and more of a necessity as perceptions and expectations around drone technology continue to evolve.